Be Life Ready is a ready-to-use student success resource that can be utilized by school districts to address the Life Ready component of the AASA’s Redefining Ready initiative. Life Decisions Group, LLC, an educational organization founded by community college Career Services professionals, created Be Life Ready as a comprehensive, developmental process that evolves throughout a student’s path to graduation. 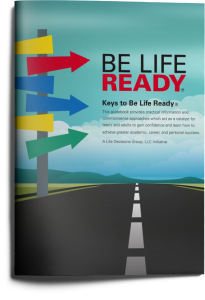 Be Life Ready can be used to support and enhance any school district’s existing efforts focused on ensuring their students possess the life skills they will need to achieve future academic and career success. 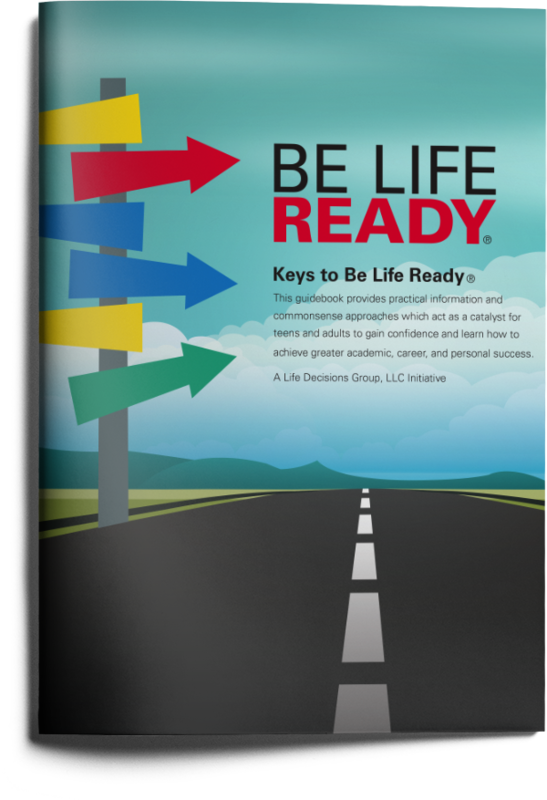 School leaders can gain immediate access to all the Be Life Ready resources at belifeready.com. The website includes the 32-page Be Life Ready Guidebook which has commonsense approaches and practical information serving as a catalyst to empower all students to reach their full potential. Proven academic foundation in reading, writing, and math based on standardized testing benchmarks and other AASA College Ready Academic Indicators. Establishment of a personal Success Team. Creation of a Success Plan indicating realistic and achievable academic and career goals. Documentation of an effective decision-making process utilized to evaluate and select academic majors, college choices, and career alternatives. Proven knowledge of life’s most impacting Big-ticket Decisions. Completion of 90% of recommended Personal Development Checklist activities. Identification of top personal/self-management, functional, and special knowledge skills. Proven ability to market oneself and interview positively. Understanding of the Job Search Formula. While limited research of life ready skills exists, assessing student outcomes for each of the Keys to Be Life Ready can begin the process of creating useful metrics. By measuring each student’s preparation for life using pre-and post-tests, portfolio assessments, and evidence-based methodologies, school district leaders can efficiently prove that their students have successfully completed a series of developmental tasks to become better prepared to be self-sufficient adults and achieve greater future academic, career, and personal success. A Success Team Inventory identifies potential obstacles that prevent a student from achieving success, and identifies people to help him or her overcome any of those barriers. A Success Planner to use to gather information needed to make important academic, career, and personal decisions. The 6-Step Decision-Making Process to help students make important decisions. A description of the 7 most important life-impacting, Big-Ticket Decisions students will need to make that will impact the overall quality of their adult lives. The Personal Development Checklist highlighting 24 activities that every student should complete throughout their high school experience. Three Skills Inventories for students to use each year to identify their personal/self-management, functional/transferable skills, and special knowledge skills. Sample interview questions to practice answering confidently so students can market themselves positively regardless of the purpose for the interview. An explanation of how to find a job that includes the Job Search Formula for students to better understand the connection between their skills and an employer’s reason for creating the job. A variety of self-reflection, mentoring, and group discussion questions to stimulate further thoughts regarding each of the 9 Keys to be Life Ready. A Pledge for students to commit to accept responsibility and work hard to address the Keys to Be Life Ready throughout their high school experience and beyond. Be Life Ready, with the Keys to Be Life Ready as a core strategy, can be a viable option for any school district wanting to create school cultures where all students evolve through a personalized developmental process to help them transition into adulthood prepared to achieve academic, career, and personal success. Questions regarding Be Life Ready should be directed to info@lifedecisionsgroup.com.